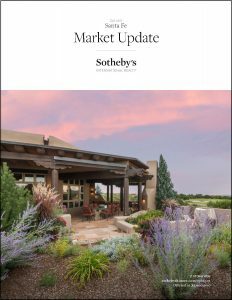 I am pleased to report that the residential real estate market in Santa Fe continued to perform at a dynamic pace throughout the third quarter of 2018. According to the Santa Fe Association of Realtors, sales of residential properties rose by 9% over the same period from one year ago. Median prices rose by 6% to $340,000 while the average sales price rose by 4% to $438,000. Average days on market, another sign of a robust activity, decreased in all price sectors. Listing inventories declined or remained flat in all price sectors with the exception of homes $2M+ which had a 13% increase in active homes for sale. In addition, sales of homes $2M+ increased by 5% compared to one year ago. As always, our goal in sharing this data with you is to create a better understanding of the trends affecting our unique housing market. We hope you find it to be a valuable resource, and we look forward to working with you to meet your real estate needs now and in the future. If you have any questions about the Santa Fe market, please do not hesitate to reach out to me. Click here to see my luxury home listings on homesantafe.com.